Carver's 3608 Aft Cabin Motor Yacht offers a surprisingly spacious interior that is beautifully finished with fine teak wood cabinetry and trim. The layout offers an expansive wide-open galley-down interior with huge windows, a luxurious L-shaped salon sofa, two private sleeping cabins, two heads and a fully appointed galley with full size fridge/freezer, stove with oven and built-in microwave. The relatively large aft deck is equipped with wet bar, ice maker and fridge, and has port and starboard molded stairways to the bridge. 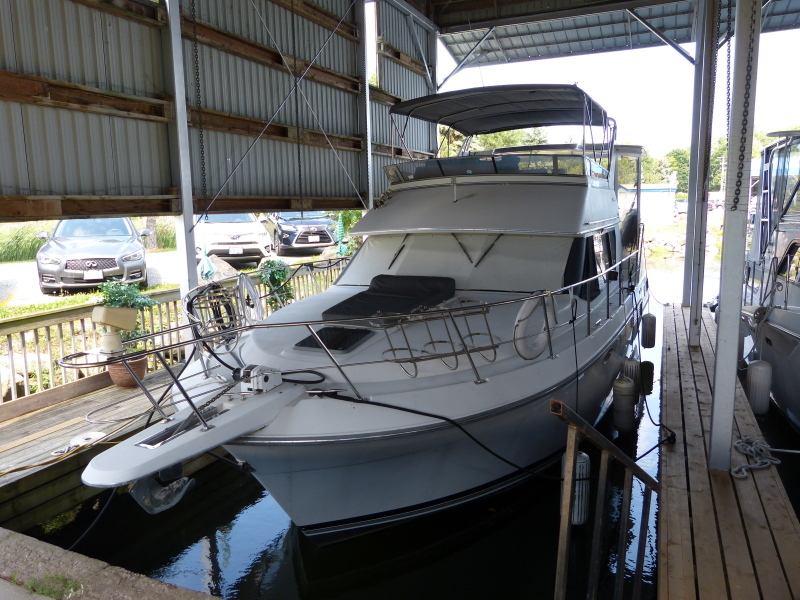 This 3608 Aft Cabin is equipped with the highly regarded Crusader 454 c.i. engines, Kohler generator, heat/air, electric windlass and dual 30 amp shore power. Her mechanical systems appear to be well maintained and the engine compartment is orderly and exceptionally clean. She is currently berthed in a premium covered slip at one of Southern Georgian Bay's finest full-service marinas with slippage and winter storage paid through April 30, 2019. We've reviewed current 3608 listings and at this price-point, you won't find better value anywhere.